Eric Jason "E. J." Henderson, Jr. is an American football middle linebacker for the Minnesota Vikings of the National Football League. GAMES/STARTS (regular season, playoffs) 2003 (16/0), 2004 (14/14, 2/2), 2005 (15/14), 2006 (16/16), 2007 (16/16), 2008 (4/3), 2009 (12/12). Total- 93/75, 2/2. • Selected by teammates as the 2009 winner of the Ed Block Courage Award and was named the Vikings 2009 Community Man of the Year. • Selected as 2008 and 2009 Vikings defensive captain and voted 2007 Defensive MVP by teammates after setting career highs with 155 tackles and 4.5 sacks. • Teammates with younger brother and fellow LB, Erin, for the 1st time in their lives during the 2008 season. Married with a child...Older brother of Vikings LB Erin Henderson, the 2008 season was the 1st time the Henderson brothers have been teammates...Works with students in the Twin Cities through the Urban Youth Outreach program and his E.J. Henderson Youth Foundation...Active in the Twin Cities community through the Minneapolis Park and Recreation Board...Joined teammates in recognizing Minnesota Vikings Junior Community Quarterback award winners, honoring students who have made their impact felt in bettering a local non-profit…Earned a degree in criminology and criminal justice in spring 2002...Avid movie fan and enjoys playing basketball in his free time...Attended same high school as Baltimore Oriole legend Cal Ripken Jr…Hosted the E.J. Henderson 5-on-5 Tournament at Aberdeen High for kids ages 8-18 for the past 2 summers...Hosted celebrity bass fishing tournament in 2008 and a celebrity softball game in 2009 as fundraisers for his Youth Foundation. 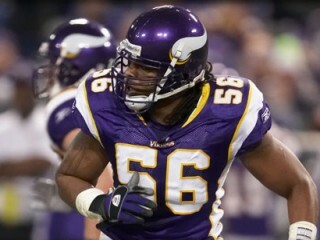 2007 Vikings Defensive MVP as voted by team. One of the most respected players on the roster by his teammates, earned the annual Ed Block Courage Award for his approach to coming back from leg injury suffered at Arizona (12/6/09)...Bounced back from 2008 season-ending foot injury that cut his season short after 4 games...Had career-best 17 tackles vs. Carolina (9/21/08)...Enjoyed best season of his career in 2007 and was voted Vikings Defensive MVP by his teammates...Garnered votes in Associated Press All-Pro balloting and recognized as a Pro Bowl alternate in 2007...Had career-best 4.5 sacks in 2007...Led the Vikings in tackles in 2004, 2006 and 2007 while finishing 2nd in 2005...Rewarded by Vikings with contract extension in week leading into game vs. NY Jets in December 2006...Enjoyed breakout season in 2006 with career-high 142 tackles and was a key element in the Vikings’ climb to #8 in the NFL in total defense and ranking #1 in run defense...Selected 40th in the 2003 NFL Draft…Was the 3rd LB taken in the draft after Oregon State’s Nick Barnett (29th-Green Bay) and Georgia’s Boss Bailey (34th-Detroit)…First Viking drafted from Maryland…Winner of the 2002 Butkus Award, presented to the top collegiate LB. Was leading team in tackles at the time he had his season cut short with leg injury and finished season ranked 2nd on squad with 100 tackles despite missing the final 4 games...Posted 4 games with double-digit tackles during the season...Had a pair of sacks on the season- catching Brady Quinn at Cleveland (9/13) in the season opener and Matt Hasselbeck vs. Seattle (11/22)...Helped Vikings defense rank #6 in the NFL in total defense for the 2nd straight season and rank #2 in rushing defense after ranking #1 in rush defense from 2006-08. Had promising season derailed by season-ending injury in 4th game of the year at Tennessee (9/28) and placed on injured reserve on 10/6/08...Led team with 39 tackles when he went on IR...Posted career-best 17 tackles with 15 solos vs. Carolina (9/21)...Notched sack against Peyton Manning vs. Indianapolis (9/14). Led the Vikings in tackles for 2nd straight season and 3rd time in 4 seasons...Recognized with votes in the Associated Press All-Pro balloting and as a Pro Bowl alternate...Voted by teammates as the Vikings Defensive MVP for the season...Had career-best 4.5 sacks and teamed with fellow LB Ben Leber’s 5.0 sacks for a total of 9.5, the 2nd-best total by a Vikings LB tandem since Broderick Thomas (6.0) and Ed McDaniel (4.5) amassed 10.5 in 1995...Led or tied for team lead in tackles 12 times...Had 10+ tackles in 8 games...Notched career-best 155 tackles to lead team. Led team with career-high 142 tackles...Snared the 1st INTs of his career and scored a critical TD on a 45-yard INT return vs. Detroit (10/8) when he took back a Jon Kitna pass with 1:31 left in the game to seal a 26-17 win...Had his 2 INTs in consecutive games vs. Detroit (10/8) and at Seattle (10/22)...Had 10+ tackles in 7 games including career-high 15 vs. NY Jets (12/17)...Led team or tied for team high in tackles 7 times on the season. 2005 Started 14 of the 15 games he played, including the final 13 straight...Emerged as a top defender in the 2nd half of the season when he notched 58 tackles in the final 8 games...Led or tied for team lead in tackles in 3 of the final 7 games, at Green Bay (11/21) with 9, at Detroit (12/4) with 8 and vs. Chicago (1/1/06) with a season-high 12. Started all 14 games he played at MLB and both playoff games…Led team with 125 tackles and 7.0 tackles for loss…Started in Monday Night Football debut at Philadelphia (9/20) and posted his 1st career sack on Eagles QB Donovan McNabb…Started 1st career game in season opener vs. Dallas (9/12)…Inactive for games at Houston (10/10) and at New Orleans (10/17) with knee injury…Returned to starting lineup vs. Tennessee (10/24) and had a pair of tackles and his 1st career forced fumble…Made 1st career playoff start at Green Bay (1/9/05) in Wild Card game and posted 10 tackles...Started in Divisional Playoff at Philadelphia (1/16/05) . Led the team with 27 special teams tackles…Posted 4 tackles each in final 3 games of the season and had 14 of his 23 tackles and a fumble recovery during month of December…Notched season-high 4 solo tackles in games at Chicago (12/14) and vs. Kansas City (12/20)…Made impact in his 1st NFL game, posting 3 special teams tackles in 2003 opener at Green Bay (9/7) in the opening game at the new Lambeau Field…Saw 1st time at LB vs. San Francisco (9/28), posting 3 tackles and a tackle for loss in relief of MLB Greg BiekerT. Consensus All-America as a junior and senior…Winner of the Butkus Award and Bednarik Trophy as a senior…Consensus All-America and unanimous All-ACC 1st-team selection as a senior…Named ACC Defensive Player of the Year and Terps MVP…As a junior, became Maryland’s 1st consensus All-America choice since 1985…All-ACC 1st-team choice and became only the 4th Terp to win ACC Player of the Year honors. A 4-year starter at Aberdeen (MD) High School who played on 4 league championship teams…PrepStar All-America selection and honorable mention All-America by USA Today…Started at MLB/RB his final 3 seasons…Nominated to play in the Chesapeake Classic all-star game and Mason-Dixon Shrine Classic…All-County selection in basketball.